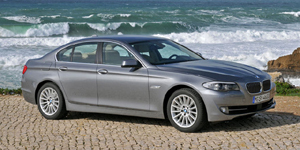 The BMW 5-Series is completely redesigned for 2011. With its forward-lunging shape, muscular flanks, and low, road-hugging front end, the 5-Series communicates its racerly velocity and apex-strafing agility. Said agility is aided and abetted by the new 5-Series' near-perfect 49/51 front/rear weight distribution. This package delivers levels of handling that have inherent stability, with no sudden surprises.